Orudzheva Naila Hidayat was born on 16.10.1956 in C. Naxchevan, Azerbaijan. She graduated from Faculty of Biology, Baku State University. After the university termination she worked as a leading scientific worker at Scientific Research Institute of Vegetable in Azerbaijan. Now she works as the leading scientific worker at Institute of Soil Science and Agrochemistry of National Academy of Science in Azerbaijan. Orudzheva Naila is a doctor of soil science, agricultural sciences. 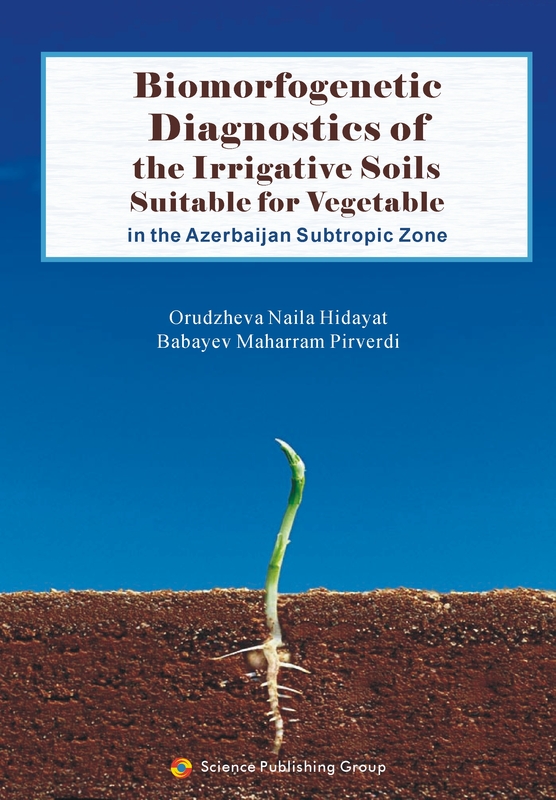 She is studying the biological diagnostics, biological activity of irrigated soils under vegetable cultures of subtropical zone in Azerbaijan. She has more than 140 published scientific works. Babayev Maharram Pirverdi was born on 13.01.1937 in C. Barda, Azerbaijan. He graduated from Faculty of Agronomy, Azerbaijan State of Agrarian University. He works as the director of Institute of Soil Science and Agrochemistry of National Academy of Sciences in Azerbaijan. He is an academician who is studying the Republic’s soil genesis, present nomenclature and classification, theoretical basis of the anthropogenic influence of irrigated soils and soils degradation. He has more than 340 published scientific works. The soils profile and soil classification (in WRB) are given according to the irrigative soils genetic layers of the subtropik zone (arid, semiarid, humid-subhumid) in the presenting monograph. Besides this is a work of ferments activity ( invertaza, ureaza, phosphataza, catalaza, dehydrogenaza) under growing plants on the constant tillage and on crop rotation, biochemical process intensity (soil nitrification and ammonification ability, shattering intensity of carbon gas which is separated from soil and cellulose that replaced in soil profile) and study of the microorganisms quantity in the gleyey-yellow soils of the Lenkoran region and alluvial meadow-forestry soils of Guba-Khachmaz region, grey-meadow soils of the Shirvan plain, irrigative grey-brown soils of the Absheron zone. Biodiagnostics of the irrigative soils according to the biological indicators in comparison with the raw versions and constant tillage on crop rotation of the subtropik zone was given on the basis of factual figures at first, an integral parameters of the soils biological state has been defined on the basis of the complex biological indicators, biological estimation has been conducted, a necessity of the tillage schemes application which have been based on scientific side according to the soil biological estimation. The monograph was a product of the scientific-research works which have been carried out in the regions differing from each other according to the soil-climate condition in 1985-2005, it is intended for specialists, soil scientists, agronomists, the persons who are busy with the soil biology. The author expresses her gratitude to the readers for rebukes and offers about monograph.